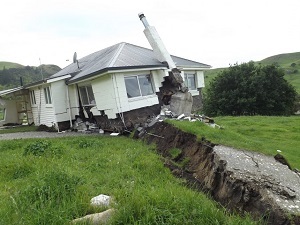 Insured homeowners will have to pay up to $69 more a year in Earthquake Commission (EQC) levies to bulk up the Natural Disaster Fund depleted by the Canterbury and Kaikoura earthquakes. The Government, as a part of Budget 2017, has announced the levy is set to be increased from 15c to 20c per $100 of home insurance cover. The cap on the maximum homeowners have to pay will be pushed out from $207 to $276 including GST. The increase will take effect on November 1. The 33% EQC levy increase comes further to a 39% increase in the levy people with home, contents and car insurance will have to start paying from July 1 to fund Fire and Emergency New Zealand (FENZ). This levy will be bumped up from 7.6c to 10.6c per $100 of insured residential property, with the cap extended from $76 to $106. So by the end of the year, insured homeowners could pay up to $382 in EQC and FENZ levies - a $99 increase from the previous year. This is not to mention higher FENZ levies on insured cars and contents. Back to EQC, while it has reinsurance cover of $4.7 billion, the Minister Responsible for EQC Gerry Brownlee says it would take more than 30 years for the Fund to reach the point where it could cover the $1.75 billion excess of this cover. This is assuming there isn’t another significant disaster like the Kaikoura earthquake. “The new levy rates mean we will be well on the way to restoring the Fund to this level within 10 years,” Brownlee says. Finance Minister Steven Joyce assures EQC has a Government guarantee, “so homeowners will be covered if there is another natural disaster”. But he says “we need to start the process of replenishing the fund”. Brownlee adds: “I expect that Cabinet will make decisions on the EQC Act Review in the coming months, however this is not expected to have any further impact on levy rates." Insurance Council of New Zealand CEO Tim Grafton welcomes a move "as soon as possible". The industry has for years expressed frustrations over the Review, which began in 2012 and was intended to be completed in 2013, being in limbo. One of the main changes the industry's calling for is for claims to be lodged with private insurers, rather than EQC, after a natural disaster. This way they can assess the costs and not be caught off guard by new claims trickling in from EQC years after a disaster. While a Memorandum of Understanding between insurers and EQC has seen claims handled like this in the wake of the Kaikoura quakes, Brownlee in February indicated he was hesitant to legislate this. "Remember, the first risk sits with the taxpayer... We have an obligation and a duty to protect that," he said. “I don’t see insurers stepping up and saying, ‘We’ll take full liability for earthquake’. When they do, then that will change the circumstances quite a bit. "In the meantime, we will just cautiously move forward in the interests of every New Zealand policyholder… to make sure that we do ensure that people are going to be properly treated at the time that they have their claims." Yes whittled away straightaway. Could be even worse if in years to come, future government(s) like past governments, decide there is too much goodies in the kitty and siphon some off for other expenditure. I get replenishing the EQC fund, fair enough. But extracting the cost of running the fire service from only those prudent enough to insure and who cannot avoid paying their share in the way big business can (especially foreign companies with assets in NZ ), is grossly unfair.